Varanger is the furthest northeastern part of Norway. The North Atlantic drift carries the warm ocean water current of the Gulf Stream, which just reaches Varanger, resulting in the high biological productivity of the coasts here. The warm current also maintains an ice-free sea year-round, meaning feeding areas are accessible all year for breeding birds. The climate in the south of Varanger varies wildly between seasons, reaching extremes of 30°C both below and above freezing. However, the climate of the Varanger peninsula is more stable, but still very cold during winter season. 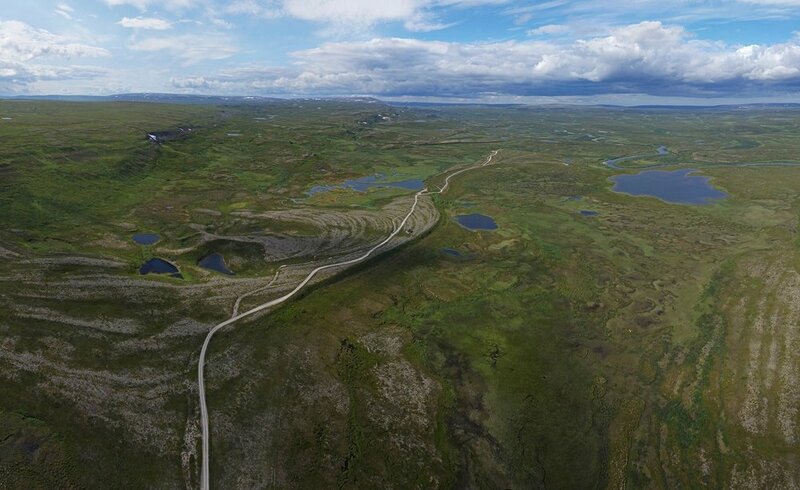 In Varanger, you can experience the northern taiga, tundra and Arctic coastline within a day’s drive. Birders and nature enthusiasts can enjoy amazingly rich birdlife and a stunning landscape. Varanger is famous for its wintering population of Steller’s Eiders. However, the wide variety of unique bird species have made Varanger one of the top birding destinations of the world. The southern part of the Varanger peninsula can be explored on a road leading from Varangerbotn, at the base of the fjord, to Hamningberg. This road includes various different villages with popular birding places. The northern part of the Varanger Peninsula can be reached from the road from Austertana, which takes you to Båtsfjord via the high tundra. In winter and early spring this is a deep snowy wilderness, covering even the tops of some cabins. Only predators like Wolverine, Arctic Fox, Snowy Owl and Gyrfalcon survive these conditions. In May, the high tundra comes alive as breeding waders and wildfowl make their return. Unlike many Arctic destinations, Varanger has a very well developed infrastructure with quality roads, transport links and amenities. The area has a number of airports, ferry terminals and car hire opportunities. In deep winter, when snow is thick on the ground, roads are always kept open and drivable by snowploughs, even up on to the high tundra. The Scandinavian and European Russian taiga is an ecoregion situated in Northern Europe between the tundra in the north and temperate mixed forests in the south. Spruces, pines and birches of varying ages are typical for this biotope. 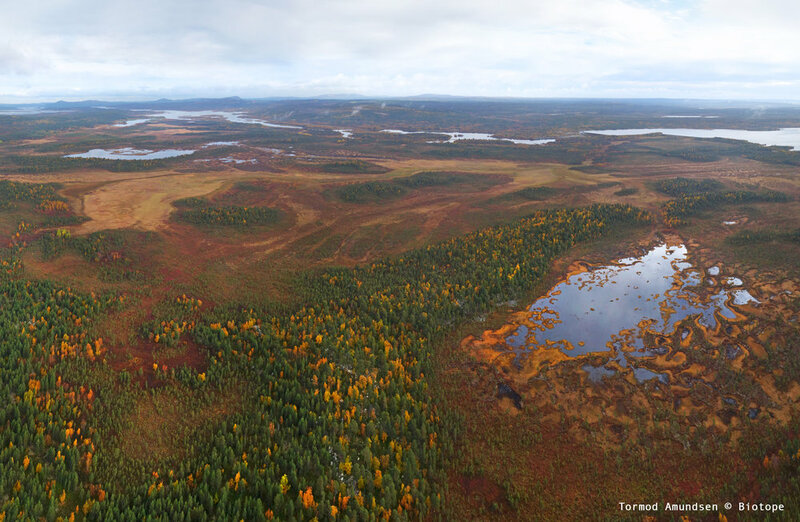 Tundra is a type of biome where tree growth is hindered by low temperatures and a short growing season. Characteristic for this habitat is the short growth of bell-heathers, crowberry, reindeer lichen and stunted willows or dwarf birch. Short growing crowberry, cloudberry and grasses shape the rocky landscape of the Arctic coast. You can find this habitat in the north where mainland Varanger meets the Barent Sea. Although there are many key sites in Varanger, offering different highlights, the scandinavian landscape is actually a spectacle in itself. Up in Varanger you can discover taiga, tundra and Arctic coast within a small area. Birch forests, marshy landscapes and rugged cliffs, appearing in a very unique light, give Varanger its individuality. Birding in Varanger is always great. However, the species present and birding spectacles change from season to season. Varanger in ´winter plumage´ is spectacular. The white rolling landscape and the deep blue sea bathed in a low arctic sunlight are the most pristine sceneries imaginable. The polar night lasts from late November to early January. By early February the sun rises at 08.15 and sets at 15.30. By mid March the sun rises at 06.00 and sets at 17.30, providing full days to enjoy the birds and the scenery. In march the seabirds return to their breeding colonies. Thousands of Guillemots, Razorbills, Kittiwakes, Puffins and Shags cover the cliffs, braving the frequent Arctic snowstorms. Glaucous Gulls and Iceland Gulls visit Varanger at this time from the Russian and Greenlandic tundra respectively. The iconic Steller’s Eider breeds in Siberia and winters in Varanger. Varanger is the only easily accessible and reliable place in the world to see this rare duck. During the nighttime of early spring owls, like Great Grey, Ural, and Tenhmalm's Owl start singing. Also the spectacular Aurora Borealis light up the night sky. Read more about birding in Varanger during winter. Varanger in ´winter plumage´. One of the key sites for winter birding in Varanger: Svartnes harbour, Vardø, outer Varanger Fjord. Filmed in February 2016. Spring is the time when both wintering and breeding birds meet in Varanger, as the first migrants return from their wintering grounds. The bird cliffs of Varanger are spectacular and full of birds from early March. You can experience some spectacular seawtaching in just one day. If you are interested in Arctic seaducks, early spring is the best time to look for them. It is also the best time to look for raptors. Hornøya bird cliff is a favored hunting ground for both White-tailed Eagles and Gyrfalcon. By the end of May, most breeding birds should have arrived back into Varanger. The sounds of Meadow Pipits, Wheatears, thrushes and wading birds echo out across the tundra and taiga forest. In this season, the weather is the most changeable. Some days the sun can be shining and the snow quickly melting, while on other days blizzards can hit the landscape. Towards mid-May, the sun fails to set below the horizon and the 3 months of Midnight Sun begins. A Hornøya bird cliff experience, March 2016: Puffins, Guillemots, Shags, Brünnich´s Guillemots, great northern lights and more. Vardø harbour in March: The Vardø days of the arctic bird festvial Gullfest 2016 (an annual bird festival in Varanger, Arctic Norway). Birding the taiga forest of Øvre Pasvik, South-Varanger. Filmed during the arctic bird festival Gullfest, March 2016. Varanger in summer is teeming with life. The midnight sun seems to energise all living creatures and birdwatching can be enjoyed 24 hours. Summer is the time when the high tundra becomes available for hiking. One of the best starting points for a walk to the national park is Komagvær valley. The area around Gednje is also very bird rich. Beautiful birds in their full breeding plumage is a particular highlight. The first eggs start to hatch and as the parents are able to feed their nestlings all day, they grow very quickly. The tundra and taiga are full of singing birds. Wading birds are particularly well represented here and scanning across the tundra or treetops of the taiga forest may reveal several different species singing to attract a mate. In early June the lekking Ruff is one of the most amazing spectacles to witness. One of the best places to view these stunning birds is up in the Komagvær valley. Click here to find out more about birding in Varanger in Summer. Hornøya bird cliff in summer: Guillmot chicks making their way from the bird cliff to the sea. Filmed at Hornøya bird cliff, late July 2015. Vardø in summer: A day visiting Vardø Hotel in Varanger, Arctic Norway. Both birds and people check in to the northeasternmost hotel in Norway. The hotel is a favoured place to stay for birders, nature photographers and basically anyone exploring Varanger. By the middle of August, the sun begins to set below the horizon at night. As dark nights return in September, the northern lights start to appear. At the beginning of September, Leach’s Petrels begin breeding and several migrant birds like Lapland and Snow Buntings, Shorelark, Redwing, Twite and Bluethroat pass through. In October, fewer birds are seen in Varanger, however the Pasvik Taiga can be spectacular with grouse species in good numbers. During spells of wet weather, large numbers of birds may be forced to land, so when the weather turns in autumn it may suddenly bring large numbers of migrating birds. Wading birds are also on the move, the majority of the birds left at this time are juveniles, which have a different plumage to the adults. The only waders left in Varanger by the end of autumn are the Purple Sandpipers, who will say the entire winter. Autumn at the bird cliff: Searching for Leach´s Storm Petrels on Hornøya bird cliff. September video blog from Biotope.